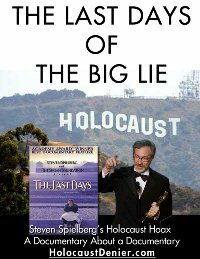 Spielberg's "documentary" The Last Days stars Irene Zisblatt, who claims to have had her Auschwitz tattoo removed by Dr. Mengele, had her skin selected to become a lampshade, escaped from inside a gas chamber, and repeatedly defecated and swallowed diamonds for a year. In addition, Spielberg's documentary hoax features another woman who claims to have escaped from inside a gas chamber, a Nazi doctor framed with an "experimentation" lie, as well as an African-American "Liberator" who was actually hundreds of miles away at the time he claims he witnessed the liberation of Dachau. 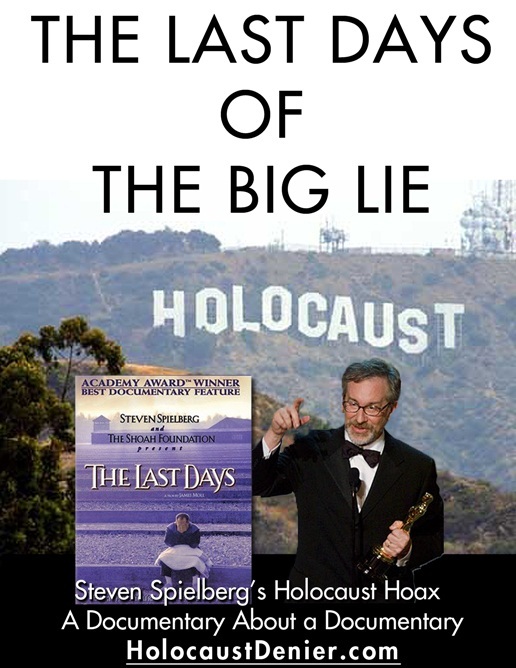 The Last Days of the Big Lie uses Spielberg’s hoax documentary as a jumping off point to expose his “USC Survivors of the Shoah Visual History Foundation” and the greater Holocaust myth.